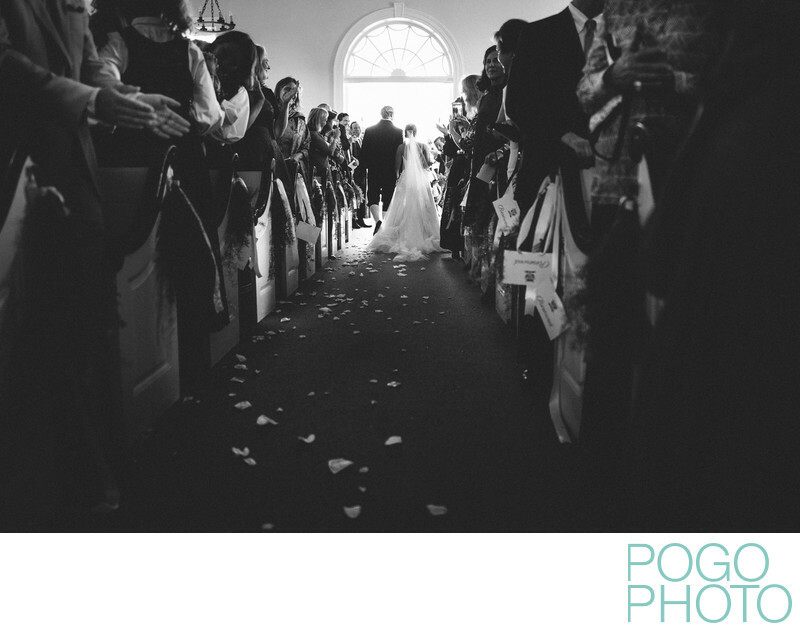 This low angle, black and white image of the couple recessing toward the foot of the aisle was captured at the Keene Valley Congregational Church during a destination wedding in Keene Valley, New York. Destination weddings are one of the many exciting aspects of our business as wedding photographers, and visiting places like Keene Valley reminds us of just how much we love what we do. There are many towns like Keene Valley scattered across the Adirondack region of upstate New York with populations hovering around or below 1,000, yet the draw of the area can increase that number tenfold during peak seasons. Understanding a couple’s connection to a particular town or region is essentially for our work behind the lens. Grasping why they chose a certain venue, hamlet, or valley lets us keep that in the back of our minds during the entire trip to the area and tying in those abstract reasons is a welcome challenge of our job. If a couple wants to go explore nearby Roaring Brook Falls in St. Huberts, it is important for us to know if it’s because they love rock climbing, they were engaged by a waterfall, or because their parents brought one of them there when they were young. Thinking about this lets us formulate how to properly express those thoughts and connections through our photography. Keene Valley Congregational Church provides enough natural light through windows and stained glass to capture an image such as this. This viewpoint in usually one only witnessed by children as all of the adults stand to witness the bride’s entrance and walk down the aisle. Seeing the pews on either side and following the leading lines into the location of the actual moment brings the viewer into the scene and gives plenty of context to exactly where the camera was at the time. Playing off the darkened crowd and the illuminated couple, the removal of color makes the image more about the people and the moment happening in the center of the frame. Feeling classic and timeless in color, the black and white version of the image becomes more visually striking as your eye lingers longer on the detail of the clothing, the hints of detail in the crowd, the delicate and antique appearance of the church's rear window, and the monochromatic presentation of the church’s interior. The tiny town of Keene Valley, along with neighboring St. Huberts and Keene, are all within the Keene Valley region, known for the famous Ausable Club. The wedding reception following this ceremony was held at the historic golf club, and the valley surrounding it enhances the golfing experience in an interesting way. The rolling hills and overall feel, assisted by the climate, is similar to that of Scotland, where golf was invented. Most golfers, professional and amateur alike, dream of playing at Scotland’s St. Andrew’s course; while it may not have the same amount of history associated with it, The Ausable Club’s immaculate fairways and perfectly unblemished greens offer a North American version of the birthplace across the pond. Playing a round before the wedding can be a relaxing morning activity for the groom, accompanied by his close friends and family. The same golf course comes in handy later in the day, as an aesthetically pleasing location for group portraits. Location: Keene Valley Congregational Church, 1791 NY-73 Scenic, Keene Valley, NY 12943. 1/160; f/2.0; ISO 4000; 24.0 mm.